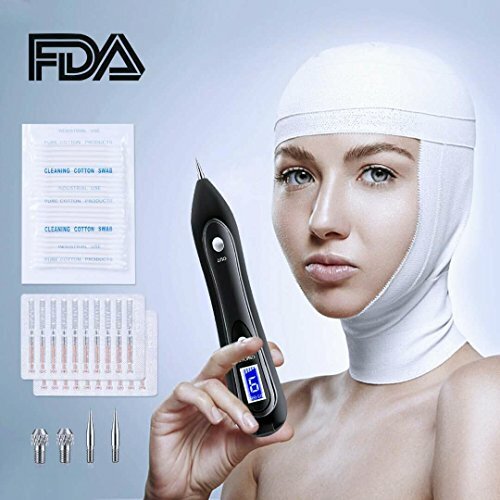 【GUARANTEE】 We are a mature Amazon seller, We have a professional after sales team,if you have any Unsatisfactory for the mole removal pen ,please contact me direactly ,we will give you a satisfied answer. 【9 DIFFERENT ADJUSTABLE SCAN SPOT POWER OUTPUTS DESIGNED】 the beauty pen have 8 different adjustable scan spot power outputs , Comes with 30 fine needles and 3 coarse needles , It applies to all kinds of skin and many kinds of skin problems. Use the fine needle on lower gears to target small moles, skin tags, freckles, and other small pigmentations. Use the coarse needle on low and high gears to target larger moles, freckles, warts, nevus, and more. It can be used on your face, neck, arms,etc. Simple to be used and lots of videos out there to help you start out.